You guys, Grounds for Sculpture is totally magical/bizarre/beautiful/inspiring/surreal/and just plain fun! I've never tried acid, but I feel like this would be a great place to go on acid, or at least, pot brownies. First off, here's what this crazy place is... It's a 42-acre contemporary outdoor sculpture park in Hamilton, NJ with so many different nooks and crannies that you get all sorts of turned around. At one moment, you wind up coming across some peaceful scenes of sculptures having a picnic in the woods, and the next, you'll be eyeing a sculpture of a naked woman bathing in a spring, or an older couple looking out onto a lake. 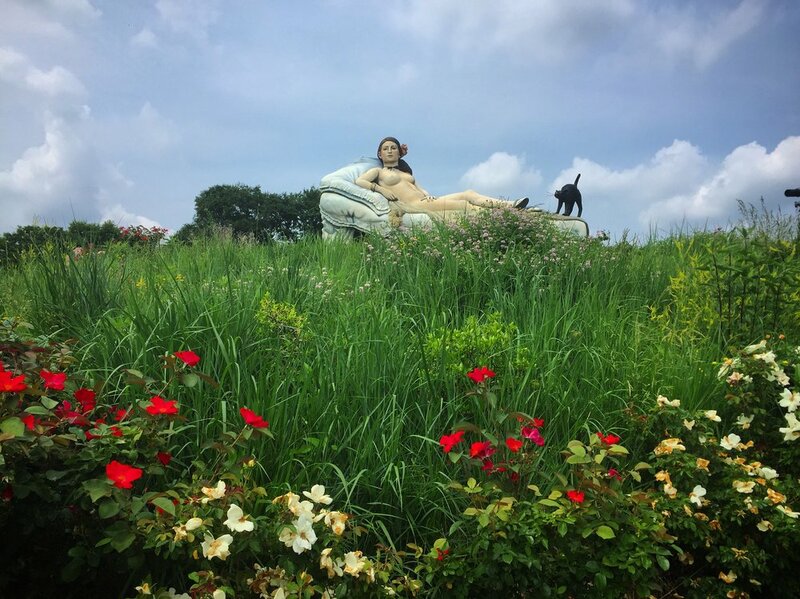 Many of the massive outdoor sculptures are recreations of famous paintings, like Matisse's The Dance, Renoir's Luncheon of the Boating Party or Rousseau's The Dream. There are also more abstract sculptures and full scenes that you are immersed in. You can wander outside for HOURS and with every turn find yourself somewhere unique and splendid. Even the main restaurant is created to take you to the northern French town of Giverny with tables outside where you can get food or drink while viewing Monet's Water Lilies (complete with a footbridge that you can walk over). But what if the weather turns sour? Grounds for Sculpture also has a full indoor museum that houses even MORE fun! You can literally sit IN Van Gogh's Bedroom in Arles. You can pose within the frame of the Mona Lisa or with the Girl with a Pearl Earring.